Figure 11.11 The Numbered Treaties cover all of the Prairie West, the western North, most of northern Ontario, and a quarter of British Columbia. By the time the numbered treaties and the reserve system were created, Indigenous peoples in what is now Western Canada faced dire conditions. Many communities were ravaged by diseases such as smallpox, and devastated by the whisky trade. The bison, on which they relied, was almost extinct. The Canadian government once again decided that the solution was model farms to accompany a policy of peasant farming through which Indigenous families were to receive “2 acres and a cow” — and through which they were not encouraged to utilize any labour-saving machinery. The government felt this would ensure Indigenous peoples would be converted to sedentary farmers, but would not be so successful that they would compete with the new settlers moving west. Not surprisingly, the plan failed. Government bureaucrats at the time blamed the supposed “lazy” nature of First Nations peoples. Historian Sarah Carter has since proven that Indigenous peoples were interested in farming, but that the government’s policies and practices undermined reserve agriculture. More important to the government was a new system of schools for Indigenous children. 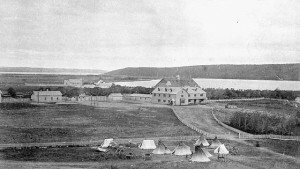 Though they had weak results in the early schools in central Canada, the Federal Government was optimistic that expanding schools into the Prairies made sense, hopeful that the Indigenous peoples there could also be “civilized and Christianized.” Starving and destitute, some Indigenous peoples also hoped the schools would teach their children the skills necessary to adapt to changing conditions and, ideally, to learn a trade that would make them self-supporting. What remained to be determined though was what kind of education system would best serve the Indigenous peoples living in the West. To help answer that question in 1879, the government enlisted Nicholas Flood Davin (1840-1901), a Regina newspaper editor and the M.P. for Assiniboia West, to study the American system of industrial schools for Indigenous peoples. Notably, as was the pattern in government dealings with Indigenous peoples, Davin did not consult First Nations. He concluded that industrial schools in which children learned a trade and which were similar to those in the United States would be appropriate and useful in the West, despite disappointing results in similar schools in Central Canada. Davin also suggested that the Canadian government forge alliances with the churches to manage the schools. These “industrial” schools were costly, however, and as a result, a parallel system of day and boarding schools was also created. Boarding schools were similar to the industrial schools, but were typically smaller with a much reduced focus on trades instruction. The first of the industrial schools — the Qu’Appelle Industrial School and the Battleford Industrial School located in the future province of Saskatchewan, and the St. Joseph’s School (also known as the High River or Dunbow school) southwest of Calgary — opened in the 1880s. 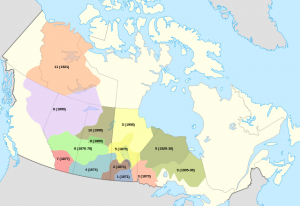 These schools would lay the groundwork for a system of schools that would eventually spread across the Prairies and into British Columbia and the North. Figure 11.12 The Fort Qu’Appelle Indian Industrial School was one of the first to open. Seen here ca.1885 with teepees and carts outside the fence. By the time the last school closed in 1996, over 130 would have operated and over 150,000 Indigenous children would have been forced to attend what would ultimately be deemed tools of cultural genocide. Indigenous children were taken from their homes, separated from their communities and families, and were forbidden to speak their languages or practice their culture. Students were poorly fed; subjected to medical experiments; forced to undertake manual labour; and were subjected to physical, sexual, and mental or spiritual abuse. The legacy of this appalling treatment is still being felt in Indigenous communities today. To ensure the schools “succeeded,” the government enacted a number of measures including compulsory attendance in 1894 (and reinforced in further legislation in 1920). However, the parents of Indigenous students were not passive participants in the plans of church and state to “civilize” their children, and many did whatever they could to prevent their children from attending these schools and to demonstrate their displeasure. Parents were angered that their children were being abused and that they were taken so far away from the reserves. Parents were also upset that students were alienated from their culture, were forced to work long hours, were not properly cared for, and could not find employment after graduation. This opposition took place, however, in a power relationship in which Aboriginal peoples were unable to bring about real change. Thus, their opposition had only a limited effect. What did sway the administrators was rising costs. Figure 11.13 St. Joseph’s (Cariboo) Indian Residential School was established in 1891 as one of the several schools run by the Catholic Church in BC. Setting Aboriginal people down the path to become European-style agriculturalists was underfunded and purposely organized to ensure they did not compete with European newcomers on the Prairies. Canadian-organized schools appealed to Aboriginal people because they held out the hope of skills and opportunities that would help their people escape poverty. The industrial schools were augmented by boarding schools in which industrial skills were minimized, the clergy were heavily involved, and costs were managed by obliging the children/pupils to do maintenance work. Compulsory attendance was legislated in 1894, enabling the abduction of children from their parents by the local Canadian authorities. By 1909 the objectives of the schools had changed again from integration to segregation and the combination of industrial and boarding schools to produce residential schools. Superintendant Duncan Campbell Scott believed that Aboriginal peoples could never occupy an equitable position in Canadian society and was satisfied to use the schools to build a marginalized people. Numbered-Treaties-Map by Yug/ STyx/ Themightyquill is used under a CC-BY-SA-3.0 license. 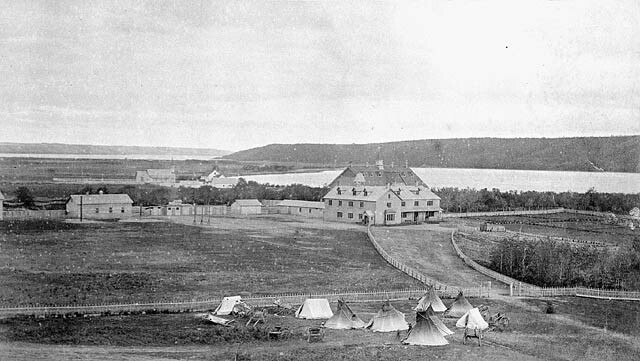 Distant view of Fort Qu’Appelle Indian Industrial School with tents, [Red River] carts and teepees outside the fence, Lebret, Saskatchewan, [May 1885?] (Online MIKAN no.3194883) by O.B. Buell / Library and Archives Canada / PA-182246 in the public domain. [Panorama of Cariboo Indian Residential School, William’s Lake, British Columbia, 1949]. (Online MIKAN no.4674075) by Canada. Dept. of Indian and Northern Affairs / Library and Archives Canada / e011080297_s1 in the public domain. 11.7 From Agricultural Training to Residential School by Jennifer Pettit, Department of Humanities, Mount Royal University is licensed under a Creative Commons Attribution 4.0 International License, except where otherwise noted.